The first question which came to my mind was if that ID is unique only within the microcontroller family (e.g. KL25Z). 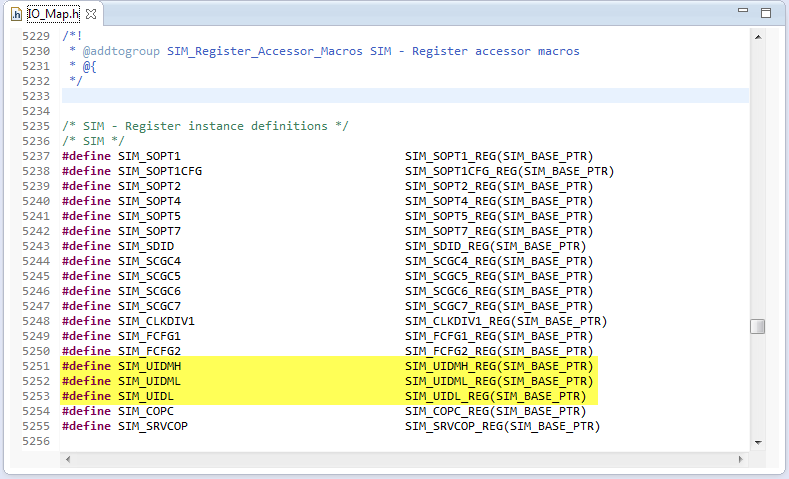 According to a response in the Freescale forum this ID is even unique across the Kinetis family! I was wondering how the UID is formatted. There must be a logical pattern which reflects the fabrication process. 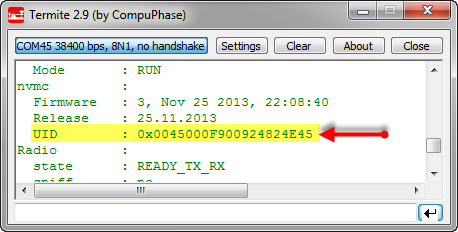 At least for Freescale i.MX the UID contains die X/Y cooardinates, waver number and lot ID (see this forum question). I was not able to find a similar information for Kinetis UID. That unique ID can be used to restrict even software to run on a device (or to run with a device). See the P&E/Freescale OpenSDA implementation which only works if the ID of the target device matches the check in the OpenSDA firmware (see “Using the FRDM-KL25Z with CMSIS-DAP to program non-Freescale ARM Microcontrollers“). As the ID is unique for each device, it can be use as input of an encryption algorithm or as a seed (different for each microcontroller). 💡 I’m using the Utility (UTIL1) and Command Line Shell (CLS1) Processor Expert components. So the ID’s are somewhat similar, but still different. As such, I think I always need to use all bits, and not just a few bytes. Hardware/Software protection: checking the ID and only allow operation if the ID is matching. Using the ID for cryptographic inputs. Reading the UID only requires to read 3 32bit registers. And until there is no information how the UID is constructed, I recommend to read and use all bits. This entry was posted in Embedded, FRDM-KE02Z, K20D50M Freedom Board, Kinetis, KL05Z Freedom Board, KL25Z Freedom Board, KL46Z Freedom Board, Tips & Tricks, TWR-K21D50M, TWR-K60F120M, TWR-K60N512, TWR-K70F120M, TWR-KL46Z48M and tagged Freescale, K20D50M Freedom Board, KL05Z Freedom Board, KL25Z Freedom Board, KL46Z Freedom Board, OpenSDA, P&E, software, technology, Tips&Tricks by Erich Styger. Bookmark the permalink. Crypto implementation on CM+ requires more resources. Thanks to your article I solved a couple of problems. may I ask which problems? We thought about simultaneous programming of multiple boards. And as we have it as a two stage process, firmware + website, after firmware uploading we have default MAC addresses , all the same. So now we have a conflict of MACs to bootload a website in the LAN segment. The UID of each micro would help generating unique initial MAC. yes, it makes sense to use the UID for such a MAC address. I have used the same approch for my RNet network stack.